The story and history of Saint Liberatus. 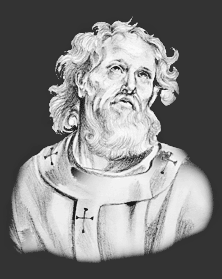 Huneric, the Arian Vandal king in Africa, in the seventh year of his reign, published fresh edicts against the Catholics, and ordered their monasteries to be everywhere demolished. Seven monks, named Liberatus, Boniface, Servus, Rusticus, Rogatus, Septimus, and Maximus, who lived in a monastery near Capsa, in the province of Byzacena, were at that time summoned to Carthage. They were first tempted with great promises, but as they remained constant in the belief of the Trinity, and of one Baptism, they were loaded with irons and thrown into a dark dungeon. The faithful, having bribed the guards, visited the Saints day and night, to be instructed by them and mutually to encourage one another to suffer for the faith of Christ. The king, learning this, commanded them to be more closely confined, loaded with heavier irons, and tortured with a cruelty never heard of till that time. Soon after, he condemned them to be put into an old ship and burnt at sea. The martyrs walked cheerfully to the shore, contemning the insults of the Arians as they passed along. Particular endeavors were used by the persecutors to gain Maximus, who was very young; but God, Who makes the tongues of children eloquent to praise His name, gave him strength to withstand all their efforts, and he boldly told them that they should never be able to separate him from his holy abbot and brethren, with whom he had borne the labors of a penitential life for the sake of everlasting glory. An old vessel was filled with dry sticks, and the seven martyrs were put on board and bound on the wood; and fire was put to it several times, but it went out immediately, and all endeavors to kindle it were in vain. The tyrant, in rage and confusion, gave orders that the martyrs’ brains should be dashed out with oars, which was done, and their bodies cast into the sea, which threw them all on the shore. The Catholics interred them honorably in the monastery of Bigua, near the Church of St. Celerinus. They suffered in the year 483. The Feast Day of Saint Liberatus is August 17. The origin of Feast Days: most saints have specially designated feast days and are associated with a specific day of the year and these are referred to as the saint's feast day. The feast days first arose from the very early Christian custom of the annual commemoration of martyrs on the dates of their deaths at the same time celebrating their birth into heaven.